TAG Farnborough Airport considers itself to be a significant member of the local business community. As such, the airport plays an active role in engaging with local business through membership of the North Hampshire Chamber of Commerce and Industry, the CBI’s South East Council and the Farnborough Rotary Club. In early 2009, TAG Farnborough Airport published a Master Plan. Airport Master Plans are intended to provide an opportunity for local communities to engage with airports on future development. The Master Plan outlines how the airport proposes to make best possible use of existing infrastructure, whilst minimizing the environmental effects. The annually permitted movements at TAG Farnborough are phased over the coming years to reach 50,000 in 2019. The FACC is an independent body established by TAG Farnborough Airport pursuant to Section 35 of the Civil Aviation Act 1982. It is the forum at which the management of the Airport interacts with local stakeholders including public agencies, residential communities and with the Airport users on a range of environmental and other Airport issues. Meetings are held three times a year and are open to the public and press. For further information please refer to www.facc.org.uk. It is estimated that 1200 people are employed on the airfield with a significant percentage being local residents. The Airport’s Sustainable Travel Plan encourages staff to adopt more environmentally responsible travel habits and reduce reliance on the car. Employees are able to reduce their environmental impact as well as enjoy the associated benefits of lower travel costs and a more active lifestyle. Extensive investment in infrastructure has been made to support these journeys, such as secure bike parking, shower and locker facilities as well as electric car charging points across site, used to service the Airport’s electric vehicle fleet and available to other site users. A dedicated internal website provides information about these facilities in addition to further materials, incentives and planning tools to help users make the change from single occupancy car travel to car sharing, using public transport, cycling or journeying by foot instead. 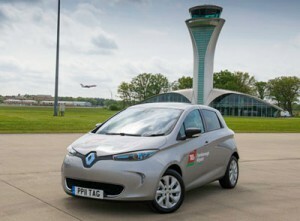 As a result of the Travel Plan, over a thousand commuter journeys are made more sustainably each year; combined with increased electric vehicle use across site, this contributes to further reduction in business related emissions and reaffirms TAG Farnborough Airport’s ongoing commitment to environmental best practice.